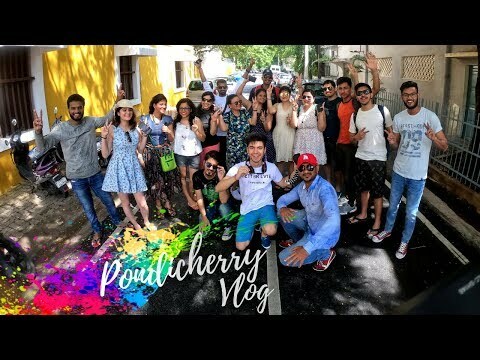 Pondicherry (/pɒndɪˈtʃɛri/ or /-ˈʃɛri/), officially known as Puducherry, is the capital and the most populous city of the Indian Union Territory of Puducherry, with a population of 745,600 and an area of 492 sq km. The city is situated in Puducherry district of the union territory, and is surrounded by the state of Tamil Nadu to which it shares most of its culture. It is affectionately known as Pondy and short code as "Pdy", and has been officially known by the alternative name Puducherry in Tamil. We made a roundtrip of around 3 days from Pune to Pondicherry and back to Pune. We boarded a flight at 2 on Saturday morning and reached Chennai airport at around 3:30 am. From there we took a cab to Pondicherry / Puducherry and haulted at Mahaballipuram beach for a while to see the sunrise. We reached Pondicherry at around 9:30 and checked in to this beautiful hostel called "Micasa Hostel". They had a really chilled out ambiance and I got to play the guitar as well, LOL! The hostel was close to the Rock Beach. In the evening we went to the Rock Beach and enjoyed the beautiful evening with some tea and french snacks. We went to the French colony to experience the beautiful colonies that reminded us of France. From there we went over to Auroville and experienced the beautiful calmness of the nature. And then we went to this beautiful place called the "Paradise Beach". At night, we once again went to the Rock Beach (our Adda!) and waited till the sunrise. The dizziness and a strong desire to sleep and melt in those matresses did not stop us from exploring more. So we went to the Botanical Garden. Apparently, Life of Pi had been shot there.